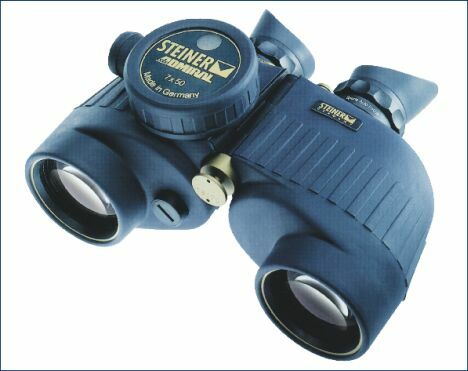 The German company Steiner offers a series of marine binoculars, specially made for important boats. These are the Admiral Gold 7x50 with self-contained compass. Each set of binoculars in this series is a one off, made to order by the expert master optics specialists working for the company, who only produce 100 pieces a year of this special series. Each set of Admiral Gold binoculars is supplied with its own mahogany carrying case with a serial number inscribed inside plus certification and the name of the owner. The optical part is made entirely by hand and equipped with 3D vision that offers clearer, brighter vision, and also ensures very low light dispersal guaranteeing high transmission values and greater contrast, as well as great depth of field precision. Precisely due to these characteristics the Admiral Gold stands up to comparison with first generation light intensifiers for night vision. The compass is integrated in the binoculars and is very stable and precise even in adverse sea conditions. For this series Steiner has realised a compass card with a wide field of vision that makes reading the results easier. The Admiral Gold 7x50 is sealed waterproof to a depth of 5 metres, has a sports-self-focussing system and ergonomic protection of the eyepiece with aeration and Memory-Ocular system, as well as a belt with quick replacement system. The Admiral Gold binoculars weigh 1.145 kg, with a field of vision of 130 metres and brightness of 51. The company offers a 30-year guarantee on these products, proof of the quality of the materials used and reliability of the production by the professionals at Steiner. For further information please contact E Emme, the dealer for Italy: via De Gasperi 95/7; 20017 Rho; Frazione Mazzo (MI); tel. 02 93904615; fax 02 93904617; sito web www.e.emmesrl.com; e mail info@eemmesrl.com.